The new space wine project will kick off later this year with the installation of "vertical greenhouses" inside a hotel in the capital city of Tbilisi, according to Georgian news agency Agenda.ge. There, floor-to-ceiling pods of soil and seeds (including grapes, strawberries and arugula) will be left to grow under hydroponic lights with minimal human interference, simulating the possible conditions of a controlled agriculture pod on Mars. 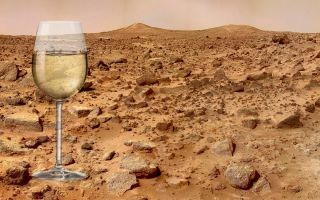 In the meantime, Georgian wine experts are hard at work trying to figure out which grape varietals might best survive harsh Martian conditions. Over the next few years, researchers at Tbilisi's Business Technology University plan to simulate a Martian environment in the laboratory, exposing soil samples to subzero conditions, high carbon monoxide levels and thin air meant to mimic the atmospheric pressure at "20,000 feet [6,000 meters] altitude on Earth," The Washington Post reported. "Whites tend to be more resistant to viruses," Levan Ujmajuridze, director of Georgia's vineyard Laboratory, told The Washington Post. "So, I'd imagine they'll do well against radiation, too. Their skin could reflect it." These experiments could well provide future Martians with grapevines — but the actual fermenting, bottling and aging would be up to them. Nobody knows exactly how fermenting grapes in microgravity will actually work yet, but NASA scientists think it's possible. The Georgia team's boozy experiments aren't the first foray into space agriculture. Astronauts aboard the International Space Station (ISS) have already begun growing salad crops in microgravity, while China's recently deployed Chang'e-4 lander will attempt to grow potatoes and rockcress (a flowering plant similar to cabbage and mustard) on the moon. The makers of Budweiser, meanwhile, have launched barley seeds into space three times in hopes of becoming "the first beer on Mars," while a batch of Ardmore scotch whisky spent three years aboard the ISS from 2011 to 2014. That project showed Earthlings that even an old drop of the pure is apparently not immune to the ravages of microgravity; the scotch reportedly came home tasting of "antiseptic lozenges" and "rubbery smoke."